Fresh homemade doughnuts filled with and cream cheese pumpkin spice frosting and covered in a chocolate glaze. In a stand mixer, combine the flour, milk, butter, yolks, sugar, spice and yeast mixture. Mix until the dough comes together and then mix for about 4-5 more minutes. When the dough has doubled in size, turn it out onto a floured work surface and roll it out until it's about 1-inch thick. Using a 3-inch diameter cookie or scone cutter, cut the doughnuts out and transfer them to a few parchment lined baking sheets. Heat the oil to 375°F using a candy thermometer for accuracy. Fry the donuts for 40 seconds on each side and transfer to a plate covered with paper towel to soak up any oil. Use a slotted spoon to transfer doughnuts. Using the handle of a wooden spoon, poke each doughnut making a hole inside. Fill a nozzle fitted piping bag with the cream filling and fill each doughnut until the cream starts to come out of the hole. 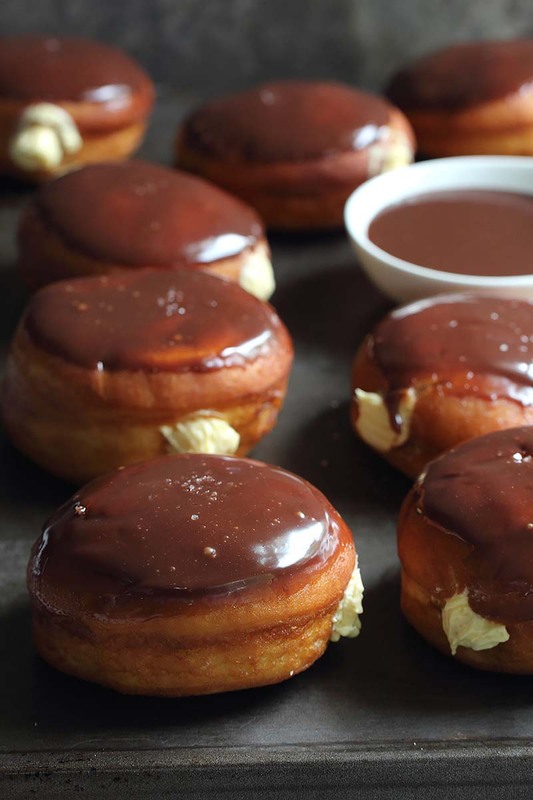 Finally dip the doughnut into the chocolate glaze and wipe off the excess. Chocolate glaze pumpkin donut looks delicious, love pumpkin, but wondering if you can bake instead of frying??? We haven’t tested this recipe for baking, but you can definitely experiment on your own! You may be interested in trying these baked doughnuts: https://redstaryeast.com/baked-brown-butter-beignets/.